October 2013 Rabbit Advocacy received word that three New Zealand Whites, two does and a buck, desperately needed to be removed from where they were. These three rabbits had been recently purchased as breeding stock for a new venture by people hoping to raise rabbits for meat. Both does had already produced one litter and those were brought to auction. This private backyard operation was in contravention of municipal bylaws, which the homeowners were aware of. Several factors, including the knowledge that they could be reported and the amount of work for virtually no return, persuaded them to give up the rabbits. The rabbits had been confined outdoors to tiny, rusty wire cages with no room to move about. These unacceptable and inhumane conditions are standard in the breeding industry. When we received the three, they were a little nervous but inquisitive of their new surroundings. 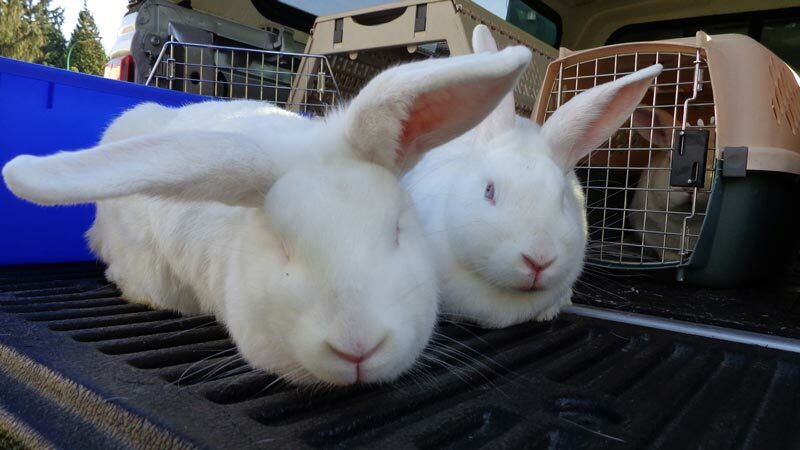 It was a bright, sunny day when we drove out to the Fraser Valley sanctuary that would become their new forever home. Sadly, there are so many more that endure horrible conditions like these, locally and worldwide. In this day and age, one would think we’d have evolved enough to recognize that animals have feelings, just like we do, and deserve basic rights. As long as we view them as property or commodities and value them for their economic worth only, rather than as individuals with inherent value, we are hindering the ethical progress of our society. We are sharing stories like this one in the hopes of educating and inspiring others to become more proactive, empathetic, and helpful to all creatures in our self-centered and abusive world. 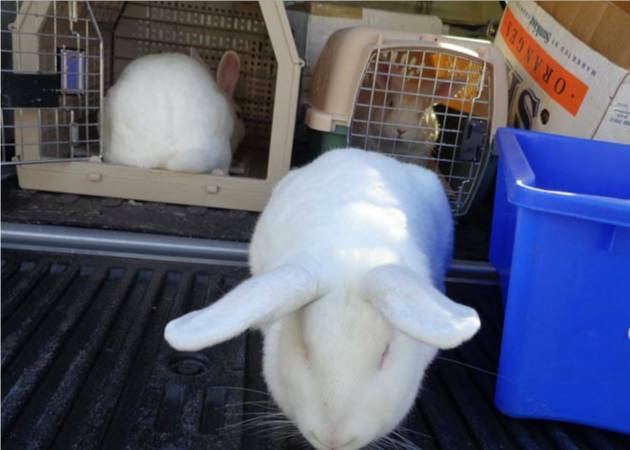 April 19, 2015: The BC SPCA has seized about 50 rabbits, housed in tiny, filthy cages from a Nanaimo property. It continues with its cruelty investigation. Rabbit Advocacy volunteers have visited a number of backyard breeding establishments over the years, and it’s been truly heartbreaking. These gentle critters are exploited solely for financial gain and most often not provided with even the basic necessities that constitute any degree of animal welfare. Sadly, rabbits are considered multi-purpose animals and the business is an unforgiving and merciless one. The B.C. SPCA says it seized 50 rabbits that were being raised for meat but were living in substandard conditions on a Vancouver Island property. The society says it received a complaint about animals living in distress near Nanaimo, B.C. After the owner failed to take steps to relieve the distress of the animals, officers moved in on April 17. "We found a large number of animals living in substandard conditions – many were being kept in very small cages, others had no shelter, there was poor ventilation, excessive garbage and debris throughout the property and many of the animals had inadequate food or water," said animal protection officer Tina Heary. Several of the animals were underweight and suffering from dental issues, she said, and a small-breed dog was also taken into custody that needed veterinary care. The SPCA will recommend charges of animal cruelty be laid, said Heary. Note: The breeder was raising the animals for food and to show. BC SPCA officers says they found the rabbits stuffed in cages so small the animals had no room to move, with many malnourished and sickly and several dead. This isn’t uncommon. Tina Heary, animal protection officer with the BC SPCA says "This isn't the first time we've dealt with rabbit breeders who breed for the show ring and for their own consumption." Those wishing to adopt a rabbit can view those that are still available online at www.spca.bc.ca. They will be spayed and neutered first. Let’s hope there will be a conviction in this horrendous case.